All of the above is not in any way to downplay the dedication, heroism, and lifelong work of the many who have fought to protect our wild lands. Though this is a struggle against an overwhelming force, there is no doubt that this brave work has held back and delayed the deluge of destruction. Some level of sentience is accorded to animals, but in the common view and the commonly accepted norms of science, no level of sentience or consciousness is accorded to plants, let alone to rocks, cliffs, mountains, the oceans, or the earth. This perspective is so fully embraced by science, and science has now taken such a lofty place of authority, that suggesting that the beings of nature have their own lives, as well as their own awareness and intrinsic value, is considered so farfetched as to not be worth a passing glance. There is a counterforce to the drive to destroy nature – a simple one – many people the world over are distressed and protest vociferously when great old trees are cut down to widen a city street. They see a tree as a living being; in a way, as a person. People feel the same reaction when they see the ocean clogged with garbage or watch any aspect of nature being treated with disrespect or disregard. There is an underlying sense among most of us, not always articulated, that Mother Nature is being harmed, and this deep love for the earth lingers on in the human psyche despite all the centuries of propaganda promoting dominance and destruction. There are two forces within human nature. At the moment, and cumulatively over the centuries, the powers of hatred and the drive to kill the wild, are winning. We need to become aware of these two forces within us and around us. If we are ever to have any hope of re-connecting with the earth and with the natural world of which we are a part, we will need to go out into nature, in respectful silence, to once again come to know and to acknowledge the sentience of all of nature, the spirits, and the beings that our most distant ancestors knew so well. We are not separate, as we believe. We are they, and they are us. One way to re-affirm this bond with nature is through art and music, which tend to value the spiritual and the spirit. There are mystical realities far beyond the prosaic, assumed certainties of the linear mind. We must get to know nature once again – revere and worship the trees, the cliffs, the moon, the stars, the great bears, the cottontails, the eagles and the red-winged blackbirds. Without this deeper perspective and reality, we are doomed to destroy the planet, all living things, and ourselves as well. In the interests of our own survival, physical and spiritual, and in the interests of the sacred lands and sacred beings all around us, it is time for us to do this. It may, or may not be, too late to save this world, but nature is not just physical, it is spirit. It is eternal and transcendent, recurring and recurring, again and again, always present in the greater cosmos that lies beyond. So this effort spent to re-connect with the beings of nature will bring a clearer, mystical reality; it will bring inner peace. It will help the beings of nature and ourselves, and, whatever the outcome, it will not be in vain. © Sharon St. Joan, 2016. Top photo: Sharon St Joan / Pine trees in the Kaibab Forest, Arizona. Second photo: Sharon St Joan / Juniper tree in Kane County, Utah. Third photo: Vitornet / Creative Commons Attribution-Share Alike 3.0 Unported / Bald eagle. 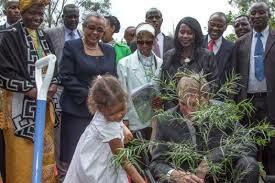 Two stories from Africa this week: WANGARI PLANTS OVER 30 MILLION TREES ACROSS AFRICA – The late Margaret Wangari Maathai was the first African woman to receive the Nobel peace prize for her work as a campaigner for human rights, and founded the Green Belt Movement in Kenya and called on people to support it by planting trees. also: RIPPLE Africa is an international nonprofit organization working in Malawi, Africa, since 2003, with a focus on education, healthcare and the environment. Read about their forest conservation project, aiming to preserve the forested hills of the Nkhata Bay District of Malawi (an area of 4,000sq.km) before they are lost forever. This week we hear from Green Hawthorn, and I share a website with jigsaw puzzle lovers. 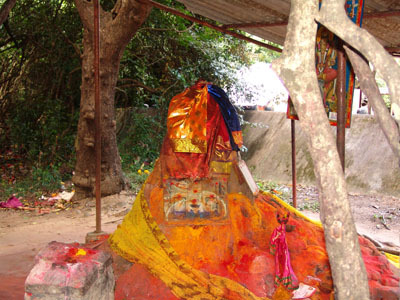 Gold and red cloths are draped around the sacred anthill, with a blue one near the top. Posters stand on thin stakes. Nearby colored cloths hang from the branches of a sacred tree, some enclosing written prayers. A trident stands in front of the anthill, where village people have placed their offerings of incense and flowers. The anthill is near the entrance of the ancient grove of Puthupet, not far from the coast of the Bay of Bengal, near Pondicherry, on the east coast of India. Really, it’s a termite hill, but these are commonly called anthills, and the insects are called white ants. The home they have built is elaborate, several yards (meters) across—and rising maybe five feet (one and a half meters) high; it is home not just to ants, but to many other creatures as well, notably cobras. It is known that cobras do often live in the anthills. Everything here appears to be sacred, and the respect accorded the grove is no doubt the reason that it all continues to exist. 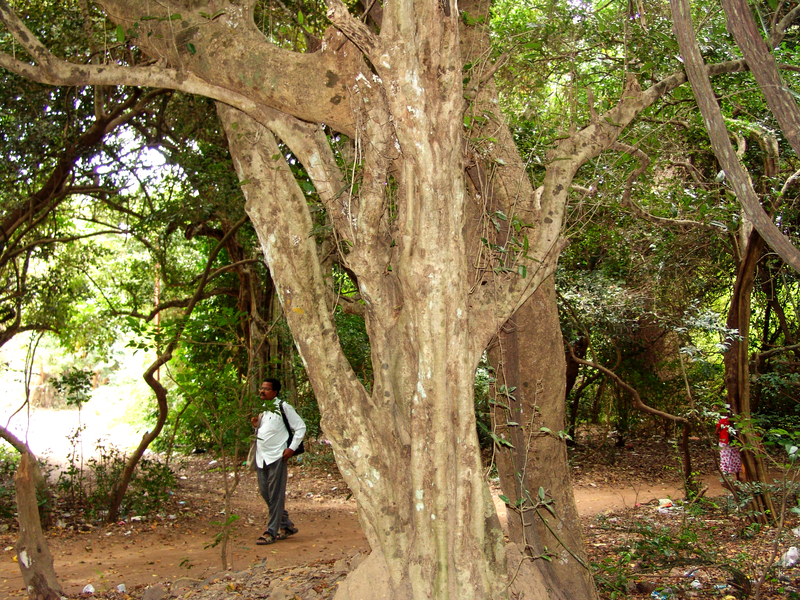 The sacred grove of Puthupet is thousands of years old. It used to be that all of India was dotted with sacred groves and forests. Some of these do still exist, and some have been reconstructed, but many have, sadly, been neglected in this modern age when the old ways are followed less than they used to be, and the lure of more secular life beckons. A botanist with the C.P.R. Environmental Education Center has done studies of these sacred groves all over south India, and it seems that Mr. Amirthalingam knows every plant and tree—not only both their common and scientific names, but also the traditional medicinal use that they may have. (Perhaps he knows them individually too—one wouldn’t be surprised!) Of the thick, turning vines that wind themselves into fantastic shapes, he says that they are a thousand years old at least. 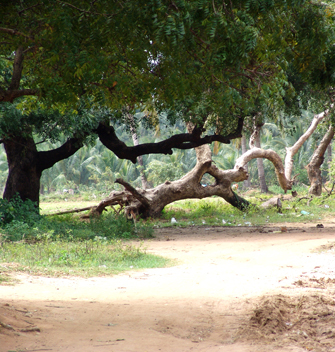 Puthupet covers an area around 40 acres (16.2 hectares). As we walk along a broad path, to the left lies a shrine made of concrete—perhaps twenty feet long (six meters) by ten feet wide (three meters). Along the span of one wall are lined up many impressive, standing terra cotta figures. These are the spirit Ayyanaar and his band of brothers. He reminds me a bit of Robin Hood, as a folk hero, though that may be a mistaken comparison. Every night Ayyanaar rides around the perimeter of the village with his companions, encircling the village and the grove to protect them. Most often he rides on a horse, though sometimes on an elephant instead. 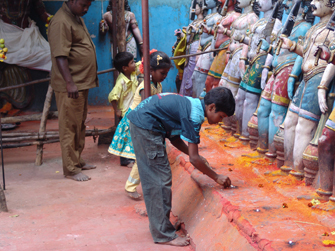 A family is there at the shrine, with three children, to leave offerings to honor Ayyanaar. As is true of ravens everywhere, the black and gray ravens of India are garrulous; they are having a cheerful squabble over a bit of food. Not far away, a statue of the mythical swan, Hamsa, looks on, detached. The stone she is made of is black from the incense offered to her. The flight of the Hamsa recalls the escape of the soul from the wheel of life and death. Ahead is an army of horses in a clearing beside some stalls where offerings are being sold. Hundreds of horses—big and small ones. They can be bought and given as offerings to Ayyanaar, I guess to help him with his nightly rounds. 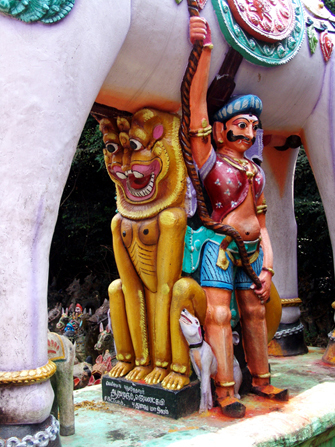 Under one of the horses, Ayyanaar stands, along with a friendly-looking lion and a dog at his feet. On the ground in one of the stalls where a man is standing—(it’s not clear to me whether he is a village priest or an artisan who makes the terra cotta horses—or maybe he is both)—are standing off to the side three stone snake statues; each one is two snakes, entwined together. Dr. Nanditha Krishna, the Honorary Director of CPREEC, who is an authority on the iconography of Tamil Nadu, says that the snake is a symbol of fertility and of wealth that comes from the earth. “The snake knows the secrets of the earth.” On the back of his head the cobra has markings that resemble eyes. A Hindu god normally has a snake to exemplify power or knowledge; for example, Shiva wears a snake around his neck, and Vishnu reclines on a snake. Ganesha, the elephant god, wears a snake as a belt—a living snake, of course. Kartikeya has both a snake and a peacock. 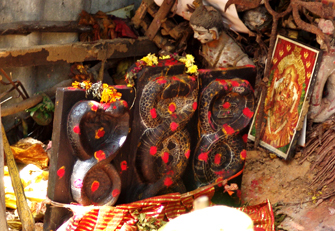 A snake canopies the head of Shakti, the Mother Goddess. From the nearby village and from farther away, people come every Tuesday and Friday to make offerings to the sacred beings of the grove. They bring a rice dish called pongal and offer lighted lamps. Animal sacrifices can still sometimes take place in India, but not here. At Puthupet all the offerings are vegetarian. 17 varieties of vines grow in the grove, along with 12 different herbs, 20 species of shrubs and 42 different kinds of trees. Dogs lie happily in the shade that falls from the plants. 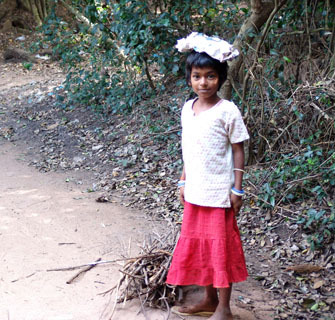 A young girl is collecting fallen branches for firewood, along with her little brother. The grove seems immensely peaceful, a place well-cared for and protected—thanks to Ayyanaar and his nightly rounds—and thanks to the respect and reverence that local people feel for that which is sacred in nature. On the way north outside of Puthupet, we pass huge salt fields where men and women are collecting salt and drying it in large mounds. There is a lot of salt available in these areas not far from the coast. 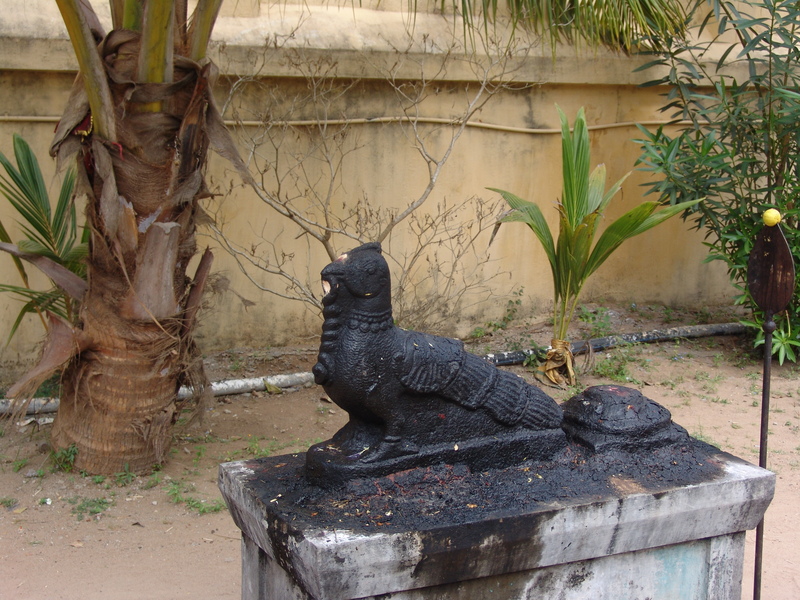 Puthupet is one of very few ancient sacred groves that have lasted intact through the centuries. Next we will visit one that has been restored and brought back to life again. 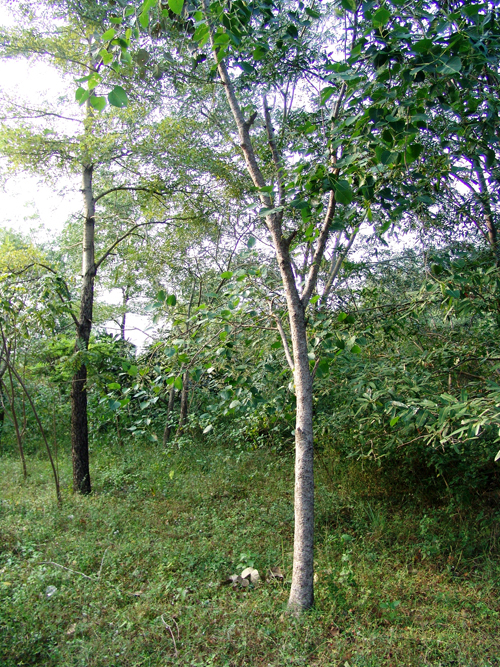 Nenmeli, like so many others, had been neglected and forgotten and had become a wasteland, until it was restored by CPREEC, who have restored 50 sacred groves in south India. To read the story of Nenmeli, scroll down to the one before the previous one.